You may ask upon reading the title of this contribution, why are we thinking about adoption of the Westminster Confession of Faith, when the whole This Day in Presbyterian History blog deals with Presbyterian history in the United States? And that is a fair question. But it is quickly answered by two considerations. First, this Reformed standard—The Westminster Confession of Faith—was, with few changes, the subordinate standard of all the Presbyterian denominations in the United States. And second, the Scots-Irish immigrants who came over to this country in its earliest days held strongly to this Reformed creedal statement. 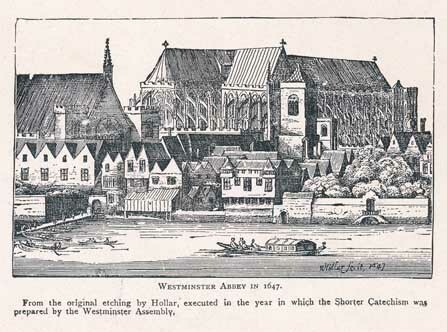 The Westminster Confession of Faith was formulated by the Westminster Assembly of divines (i.e, pastors and theologians) in the mid-seventeenth century, meeting at Westminster Abby in London, England. To the one hundred and twenty divines, primarily from the Church of England, were added nine Scottish divines from the Church of Scotland. While the latter were seated as non-voting members of that Assembly, still their presence was felt in very effective ways during the six-year study that produced this confessional standard. When it was adopted by the Parliament in England, it then went to the General Assembly of the Church of Scotland, where it was adopted without amendment onAugust 29, 1647. It then became the summary of the teachings of the Old and New Testaments which was adopted by both the teaching and ruling elders, as well as the diaconate in each local church, in every Presbyterian and Reformed church deriving from that tradition. Small changes have been made by conservative Presbyterian bodies in our United States which do not affect the overall doctrinal contents of the Confession. The majority of those changes were made in 1789. You can ask your pastor for more information about those changes. The historic importance of this document is one reason why we have daily reference to it in this devotional guide, as we seek to make our friends more knowledgeable of its magnificent statements. Words to live by: Most of the Presbyterian denominations do not require their lay members to take vows which speak of their adoption of these historical creedal standards in order to join the church. Yet a careful study of, and acceptance of this Confession of Westminster will give you a solid foundation for understanding the doctrine and life of the Word of God. We urge you to do so, perhaps asking for a class in your church on it, or just studying it yourself for your personal and family benefit.